Does your Anti-GFP antibody [6AT316] (ab38689) detect eGFP? The epitope of the antibody has not been mapped, and it has not been tested with eGFP, so we cannot guarantee it detects eGFP. However, EGFP differs from GFP by only a few amino acids, there is a great chance the antibody will detect eGFP. 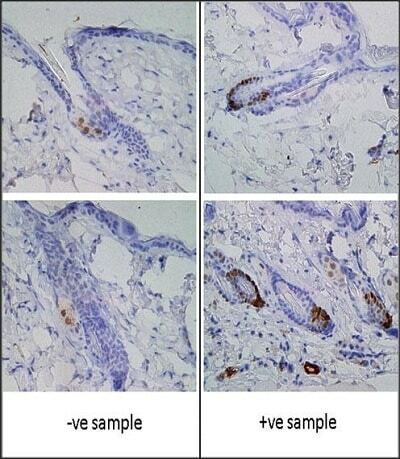 Please provide an IHC-P protocol for this antibody. PROCEDURE: Solution Preparation PBS, pH7.4: 10 mM Na2HPO4, 1.8 mM KH2PO4, 50 mM NaCl, 2.7 mM KCl Blocking buffers: 5% BSA/0.5% Tween-20 in 1X PBS. Protocol 1. Deparaffinize and rehydrate sections as follows: 3 x 3 min with xylene; 3 x 2 min with 100% ethanol; 2 min with 95% ethanol, 2 min with 80% ethanol, 2 min with 70% ethanol, and 5 min with PBS. 2. Perform citrate buffer antigen retrieval (see below). 3. Block endogenous peroxidases by soaking slides in a solution of 90% methanol/3% H2O2 for 15 min at room temperature (RT). Then wash 3 x 5 min with PBS. 4. Shake and wipe off excess PBS. Circle all sections with a pap pen. Add 75 ul of Blocking buffer to each section immediately. Do not touch sections with tip. 5. Incubate 1 hr to overnight at RT in a humidified chamber. Do not let the slides touch each others. 6. Dilute primary antibody in Blocking buffer. Add 75 ul per section and incubate 1 hr to overnight at RT in a humidified chamber. 7. Drain primary antibody off section. Wash slides 3 x 10 min in PBS. You may have to wash slides in PBS + 0.1%-0.5% Tween-20 for some primary antibodies. 8. 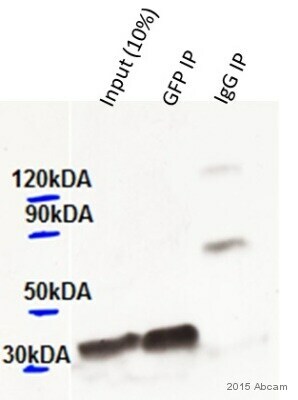 Dilute secondary antibody 1:1000 (this may require optimisation) in Blocking buffer without Tween-20. Add 75 ul per section and incubate for 1 hr at RT in a humidified chamber. 9. Drain secondary antibody and wash slides 5 x 10 min in PBS + 0.1% Tween-20. (For secondary antibodies that are peroxidase conjugated, go to step 11.) 10. Make ABC according to manufacturers instructions 30 min before time of use (mix 5 ml of PBS with 2 drops of solution A and 2 drops of solution B). Incubate samples for 45 min at RT. Wash 5 min in PBS. 11. Make DAB solution according to manufacturers instructions. WEAR GLOVES: Mix 5 ml ddH2O with 2 drops of buffer, 4 drops of DAB and 2 drops of H2O2. (If you want a gray-black stain, add 2 drops of the Nickel solution, and mix). Add immediately to slides and wait for color change (approximately 2-10 min). Drain slides and place into ddH2O for 5 min. Dispose of DAB waste with bleach. 12. Counterstain with methyl green (1 min) or hematoxylin (3 sec). Wash 3 times with ddH2O. 13. Immediately dehydrate in 70% ethanol, 80% ethanol, and 100% ethanol (one dip each). 14. Mount and seal coverslip with nail polish. 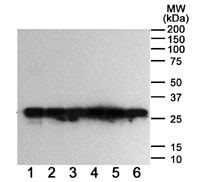 This ab38689 GFP antibody ab38689 works well with Sodium Citrate Antigen Retrieval: Sodium Citrate Antigen Retrieval: 1. Place slides in a glass slide holder and fill in the rest of the rack with blank slides (10 total) to ensure even heating. 2. Place rack in 600 ml of 10 mM sodium citrate, pH 6.0 in a glass 2L-beaker. Mark a line at the top of the liquid on the beaker. 3. Microwave for 20 min total, replacing evaporated water every 5 min. 4. Cool slides for 20 min. 5. Wash 4 x 3 min in ddH2O, and 3 min in 1X PBS. 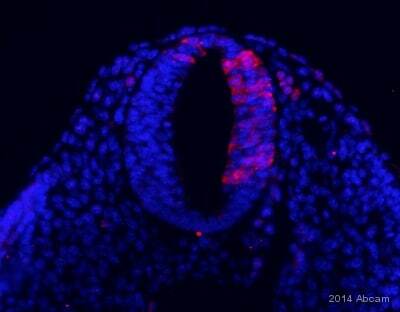 I am looking for info on the specificity of your antibodies for IHC on tissue sections. 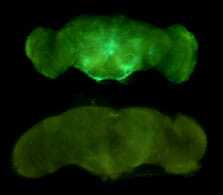 I will be attempting to locate GFP, RFP and perhaps one more marker in fixed tissue. Many of your RFP antibody descriptions state that there is no cross reactivity to GFP but your GFP antibody descriptions do not address cross reactivity to RFP. This product does not cross-react with RFP.